This is a special charm to bring back a loved one who has gone to a foreign country and not come home. Such sad domestic conditions are most common in India, where the parents have educated their child and then he goes to a foreign land for further studies and never comes back or if he does it is only for a short period; out of some guilt complex. Thus more and more parents in India are left to the mercy of old age; this is indeed a sad situation. The charm given here has to be prepared on a piece of paper with any kind of ink and then wrapped in the old clothes of the loved one who has not come back and kept under a stone Chakki [ traditional grinding wheel]. 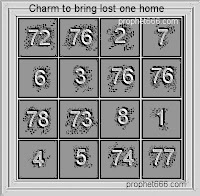 This spell is said to bring the loved one back home. Guruji what if we dont have chakki can we keep it under any heavy object. The information contained in the post is as per the Tantra, however, there is no harm in trying the remedy using a heavy object instead of a chakki. 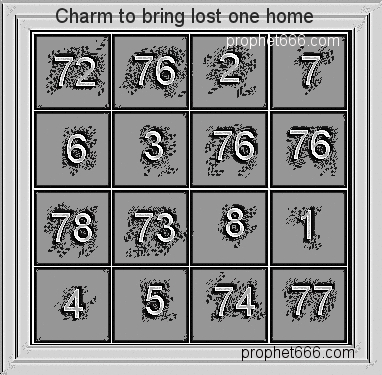 Yeas, you can attempt this Yantra Experiment to see if your problem is resolved. If we don't have the clothes of concern person than what to do ? sir, if we dont have cloth of concern person what to do?